Chris's Squirrels and More in a nutshell! Chris's Squirrels and More specializes in hard to find rehabilitation supplies for all animals. 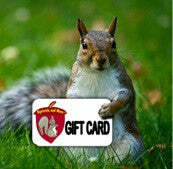 We also offer a wonderful gift line for the animal lover with our specialty being wildlife. International Customers: Please be advised that purchasing from our website from Countries outside of the United States may incur additional fees, duties, taxes per their country. We cannot be responsible for additional fees nor do we have anyway of knowing if or what these fee's may be.